September 5, 2018 (Newark, NJ) – America’s SBDC “State Star” award was presented to Regional Center Director Robert (“Bob”) Palumbo of NJSBDC at Rutgers-Camden during America’s SBDC national conference in Washington, D.C. (September 4-7). A special reception was held the evening of September 4th at the Marriott Marquis. Each of the 50 state SBDC networks nominates their staff members who have made outstanding contributions in assisting entrepreneurs and small businesses, promoting greater opportunities for growth, and impacting greatly on the state and national Small Business Development Centers program. Palumbo was recognized from New Jersey’s SBDC (America’s SBDC New Jersey). Bob Palumbo is a Camden County native who has acted in different position capacities for 16 years at the NJSBDC network. 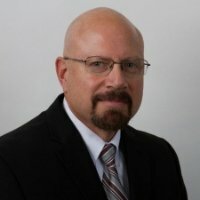 He first served as a private business management consultant with small business clients of the Rutgers-Camden SBDC office for several years. Shortly thereafter, Palumbo was sought out to become Center Assistant Director. He was subsequently promoted to Center Director where he has led the Center over the past two years into innovative areas. Palumbo has had a successful career both as a small business owner, business consultant, and “Director” of this regional SBDC operation. His wide-ranging career includes owning and running his own video production company, which also found him engaging on private sector venture partnerships producing documentaries, etc. His credentials include an M.B.A. in Finance from Philadelphia University. He received his Bachelor’s degree in Accounting from Rutgers University which he puts to good use by assisting business owners with cash flow analysis, accounting and other specialized financial aspects of operating a business, aiding business owners to make solid, bottom-line company decisions.